I usually start shed hunting as soon as the snow disappears in hopes of finding the sheds before mice, squirrels, and other rodents destroy them. Starting out I try to hit all the areas near food plots, because the deer are consistently going to food during the late season. I also check fence gaps, creek crossings, and their main bedding areas. It's a great way to get out and check for sign, see where the deer have been living, and I always bring orange tape along just in case I find another perfect tree stand location. As spring gets closer, I am always keeping an eye open for sheds whether I'm turkey hunting, planting food plots, or setting new stands. Remember; if you find a big shed don't stop looking until you find the other side! Normally when these big bucks drop one side they feel so lopsided that they will try to get rid of the other side within a short distance. Mark where you found the first big shed and then circle around that spot until the other side turns up. The first photo came while he was still in velvet, and throughout the season we kept getting more and more photos. In fact, one hunter was lucky enough to get a shot on him but his arrow hit the buck in the neck. With a small blood trail it was obvious this buck wasn't going to die from the shot, but infection later on is always a concern. We were reassured once he started showing up on the Cuddeback's again a few weeks later. 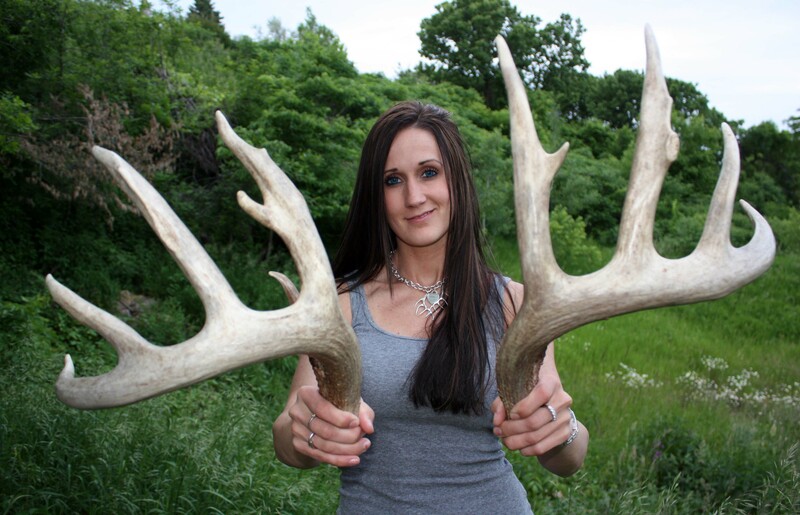 Lastly finding his sheds sealed the deal that this big guy survived and should be a real bruiser this fall. He may even have a crazy rack from the arrow wound in his neck, but only time will tell!